If you have the goal of becoming a home owner, but are wondering if you qualify for a mortgage… We can help you answer that question. There are three main factors to consider in determining if you qualify for a mortgage; your income, credit, and assets. Because everyone has a financial outlook that is as unique as your fingerprint, your qualification needs to be evaluated by a licensed mortgage consultant. However, this article will give you a great outline for setting your financial goals to become a home owner and qualify for a mortgage. There is a simple answer to the question about your income and your ability to qualify for a mortgage. You must be able to show that you have the ability to make monthly mortgage payments. If you are currently renting an apartment or home, you probably know how much you can afford to pay towards a monthly mortgage payment, based on your current rent. The more complex answer involves a closer look at your debt to income ratio, or DTI. If you have current debts like student loans, car payments, or credit card debts those debts can affect the amount that you qualify for. Most loan programs require that your monthly obligation to debt repayment (including the mortgage) not exceed approximately 43% – 45% of your monthly income. Speaking with a licensed mortgage consultant is the best way get an accurate analysis on your income and ability to qualify for a mortgage. In order to qualify for a home loan, your credit history should reflect that you use credit responsibly with a good score. Taking care of your credit score is essential to qualifying for a mortgage. Making payments on time, keeping balances low on credit cards, and avoiding payment defaults are some of the best ways to maintain a good credit score. To qualify for a mortgage you not only need to show that you can make the monthly payments, but that you have the funds for the up front costs of buying a home. Assets like checking or savings accounts are commonly used to show the available funds for the down payment and closing costs. Other sources of these assets can be shown in a potential withdrawal from a retirement account, the sale of a current home, your tax return, or a gift from a close family member. We outlined the details of creating a down payment savings plan in this blog post. 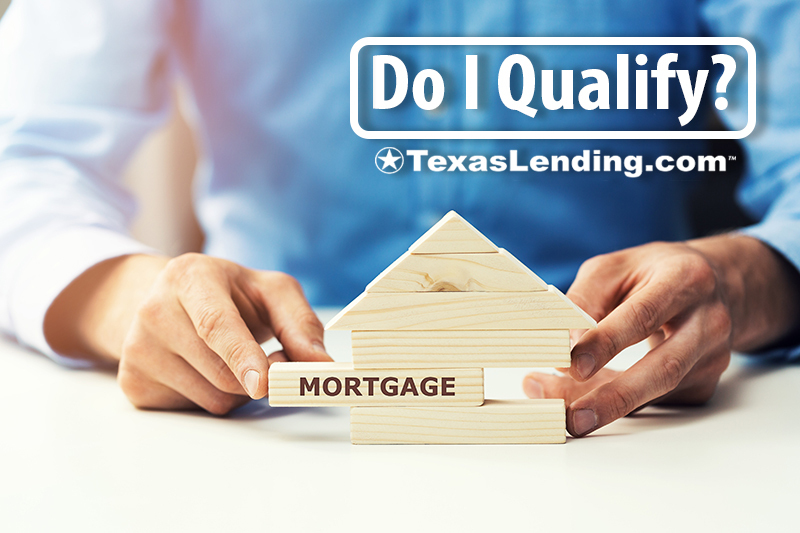 At Texas Lending we understand that our customers aren’t experts in the mortgage industry, which is why we take the time to educate you about your potential qualify for a mortgage. Calling to get answers to your mortgage questions is free! Get started today at TexasLending.com.